After 3 weeks we finally have left Luang Prabang. Our extra time there was good and we have met new friends. We enjoyed the sense of familiarity with the town; we started to know where everything was and when we walked down the street there were opportunities to stop and chat with familiar people. During the time in Luang Prabang we became friends with the owner of the Hive Bar (www.hivebarlaos.com), Troy, a really gentle giant from Canada. 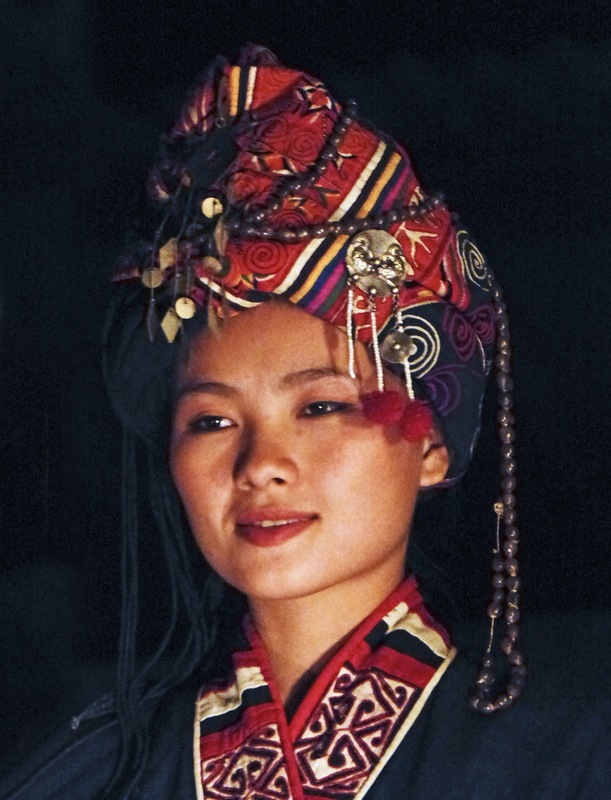 Hive does a fashion show presentation of 100 ethnic costumes from 14 different Laos Hill Tribes. We also got to know a very special person named Patrice who has a silk weaving studio and is a collector art dealer. 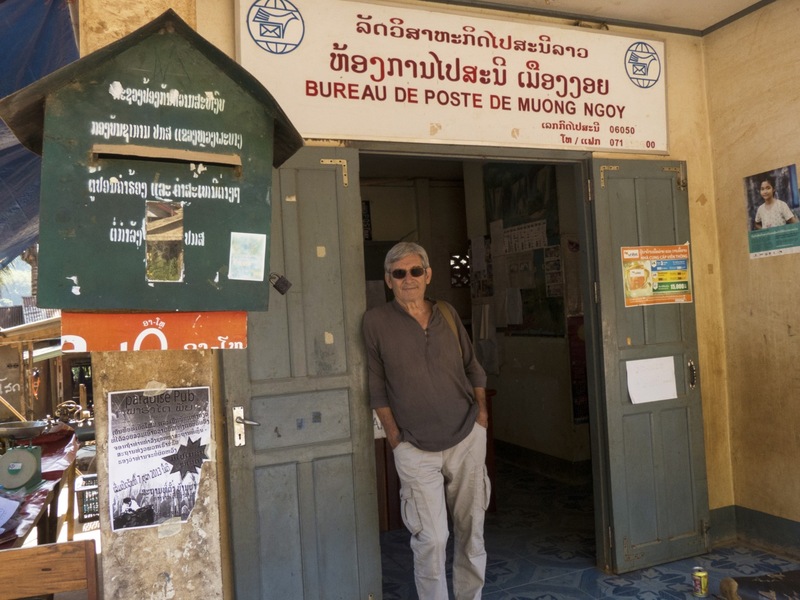 He owns a gallery called Le Pavillon de Jade, 41 Sakkarine Road, Luang Prabang which is recommended in Conde Nast. He shared his museum quality antique treasures with us and prepared us amazing meals while Michel worked with him on a still photography project. He helped me with my education on the Vietnam war. Michel worked with Celine and Virginie in the store called Kopnoi (http://kopnoi.com/). He photographed the store and contents and as a trade we drank coffee and tea and visited with our new friends in the bookstore called L’etranger. All of our new friends were extremely helpful and gave us so much excellent advice about Laos. 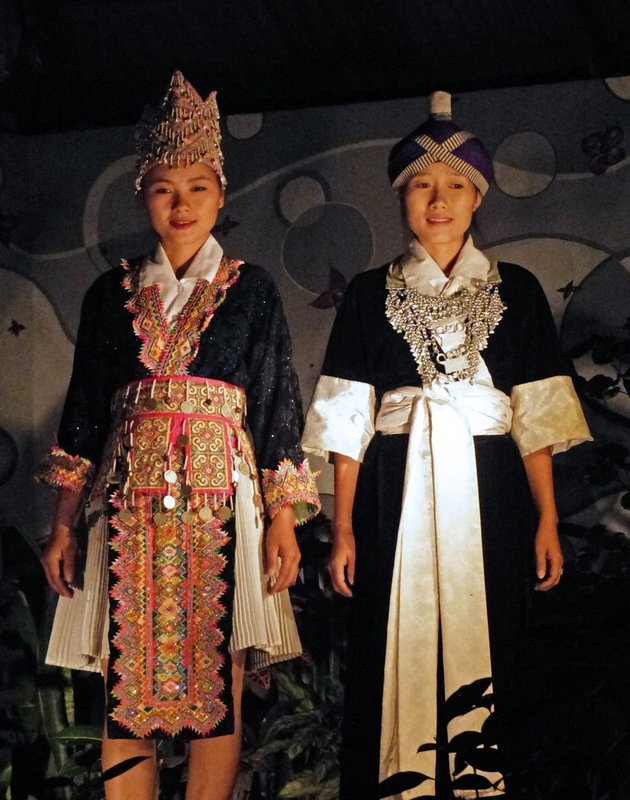 If you come to Luang Prabang we recommend that you visit these wonderful people. We learned that we can rent a luxury apartment (Mekong River Estates) on the Mekong River for about $2000 US dollars a month (much more if a shorter period of time). I saw the apartment and it is perfect and with a pool. We visited with the architect Jean Pierre Dovat who lives there and entertained us one evening. However, this is a very special real-estate and done in the most refined decor and landscape. We heard that we can rent a house for $200 to $300 a month on the other side of the Nam Kahn river. Have not seen that house yet so when we go back we’ll take a look. That is more in our price range but let’s see what $300 a month really gets us. We heard it is nice and has everything we need. We understand it is best to have your house guarded to avoid being robbed. We also understand that we must work with a local Laos person in order to get that price. Still many things to learn. Now we are here in Nong Khiaw after taking a minivan for 70,000 kip and a four hour drive. We have a nice room on the Nam Ou river for $100,000 kip at the Vongmany Guest House. 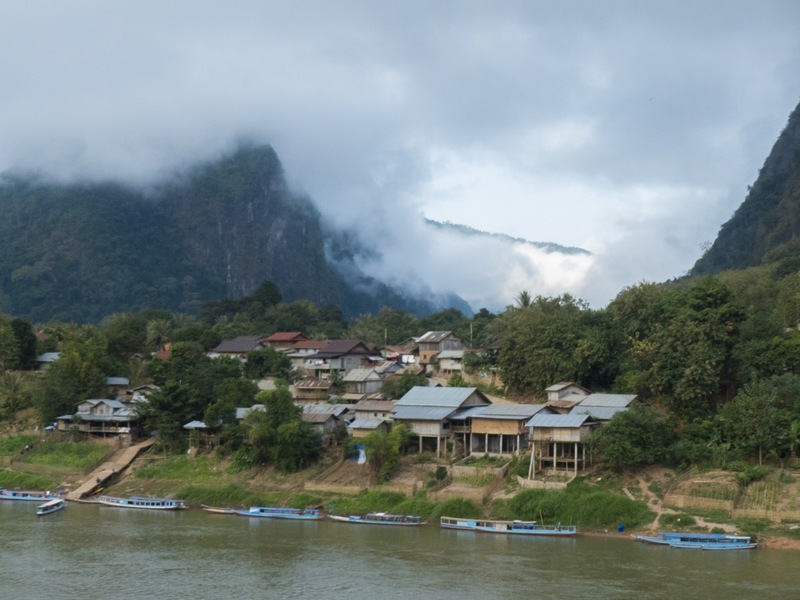 This is a return to paradise for us as we came to Nong Khiaw in 2008 and fell in love with it. It is interesting to see how our perception of Laos has changed now that we have been here for a month and half. 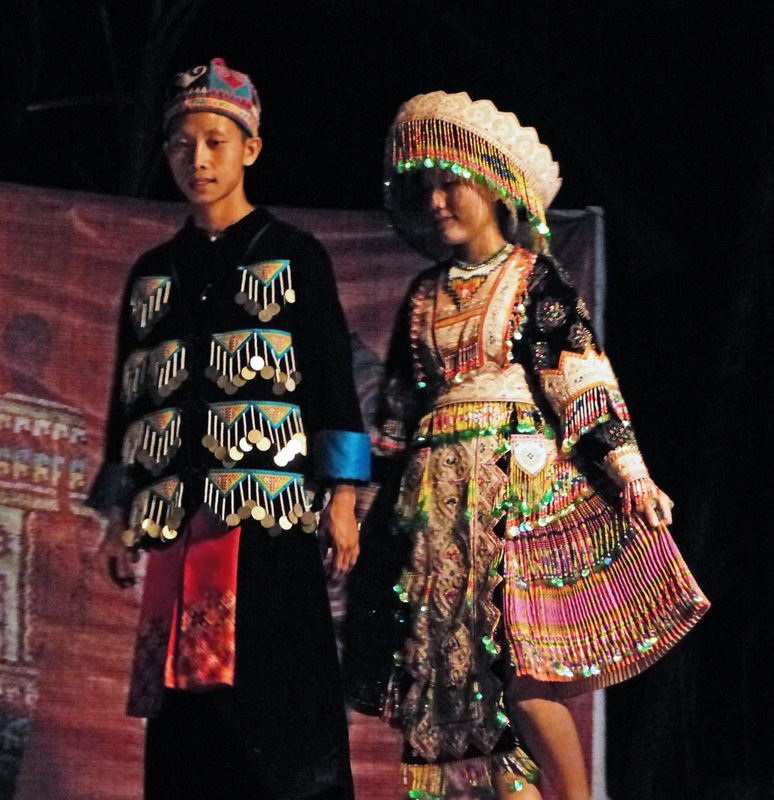 We understand the Laos people better and how poverty and tourism shape their perceptions. It breaks my heart each time I meet a small child who holds out their hand and asks for “Kip Laos”. The tourists coming through have taught them to beg. The villages in the area have more money now then in 2008 and most bamboo huts have been replaced by bricks and concrete. The villagers no longer bath in the river as they all have running water. Power lines and a new road have opened up many once isolated villages to the tourists. Yet the beauty of the river and the limestone mountains have not changed. When we stand on the bridge looking at the view there is still a feeling of timelessness. 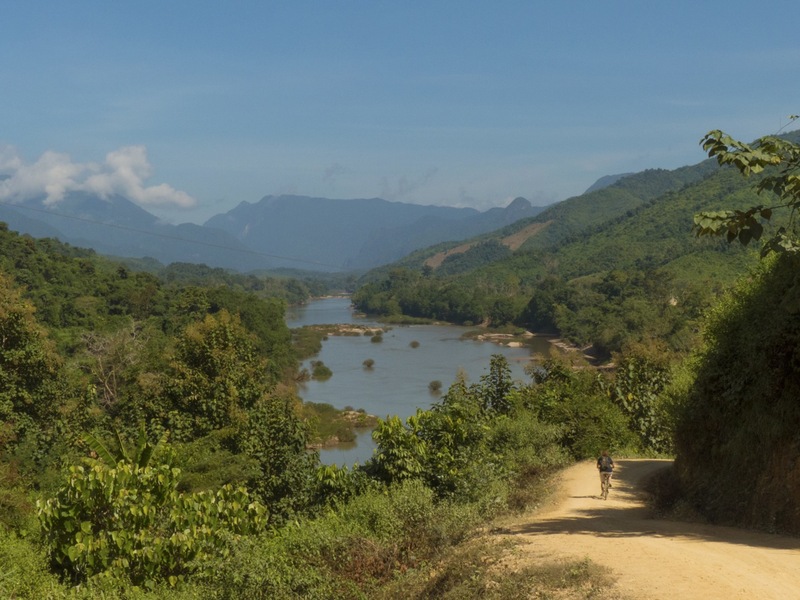 We rented bikes and rode up and down steep hills to two villages along the Nam Ou river. The villages are next to the new road built in 2012 when power was first run along the road to the village of Muang Noi. The ride was hot, dirty, and exhausting. All in all about 24 kilometers. Arriving at each village was satisfying and well worth the effort. We met a Laos school teacher who teaches English at the local school in the second village. She walked around town with us and showed us the local temple. The second village had a very pastoral feeling. The water buffalo wandered around free on the streets with the chickens and pigs. Everyone smiled and appeared happy to meet us. On another day we decided to take a hike up to a view point. For those of you who have hiked the Smokeys it was a little tougher then the Chimneys. 2 or 3 kilometers straight up. The locals had prepared the trail and there were little steps carved in the dirt most of the way up. Michel had fun with the flora and fauna on the way up. The end of the hike was a bamboo platform hanging off a cliff. 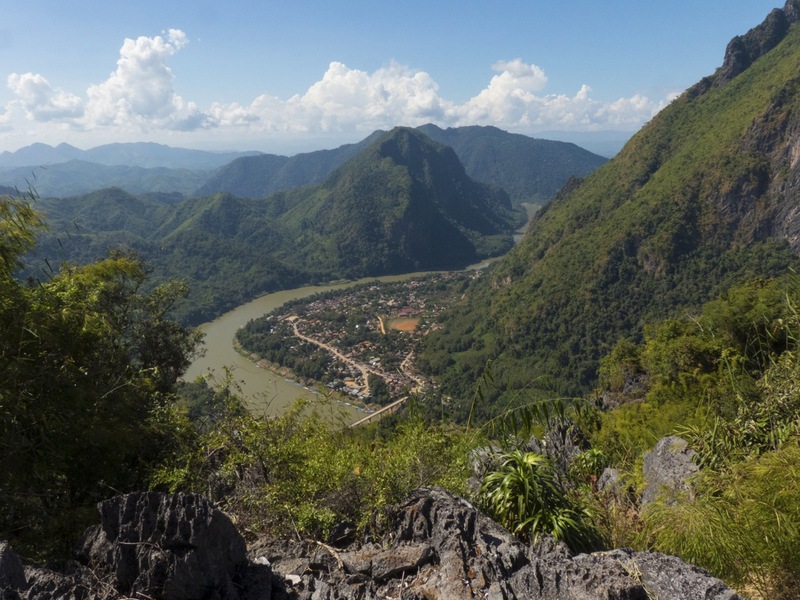 Views of Nong Khiaw and the villages on the other side of the river were the reward for the climb. 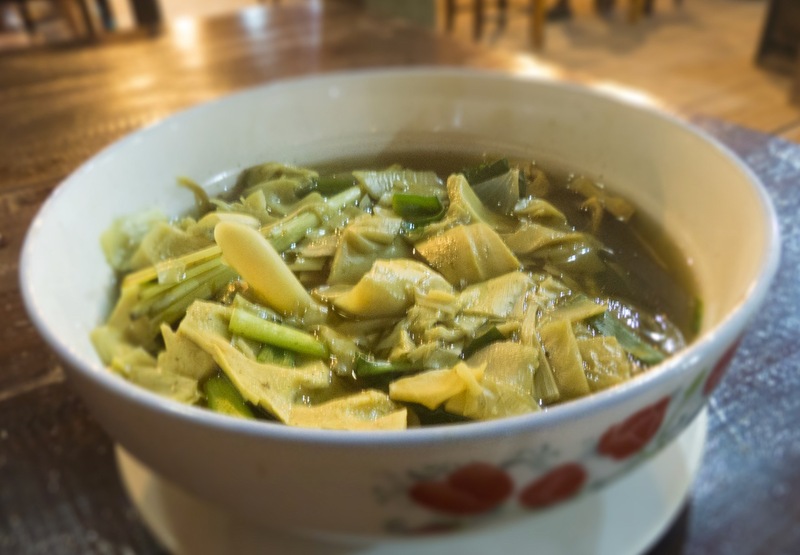 Perhaps one of the best parts of our stop in Nong Khiaw was the restaurant at Vongmany. I was beginning to be tired of Laos food. We had been eating at the same restaurants over and over again in Luang Prabang. All local food and inexpensive but I had started to dream of a nice pasta with olive oil and parmesan cheese and maybe a glass of Bordeaux. It is possible to find similar things here but the cheese is not right nor the wine and you leave feeling unsatisfied. At Vongmany we ate amazing Bamboo Soup. The soup had an earthy taste. The delicate broth tasted of herbs and spices. The pieces of bamboo hearts are tender and flavorful. We also tried the local Mok Paa;pieces of fish combined with dill and other local herbs. This is mixed with coconut milk and creamed rice inside a banana leaf and then steamed. The picture doesn’t communicate the perfect combination of those tastes. 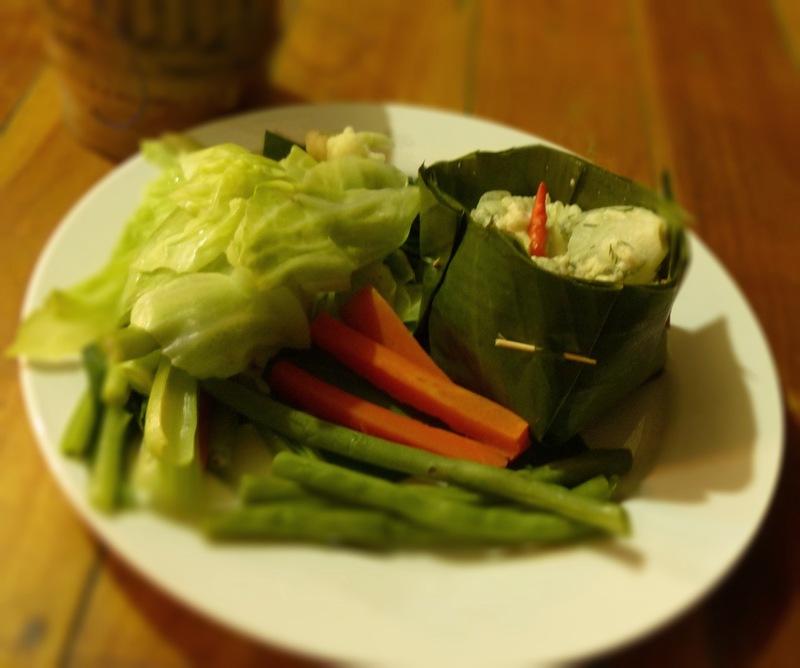 It was one of our best meals in Laos. 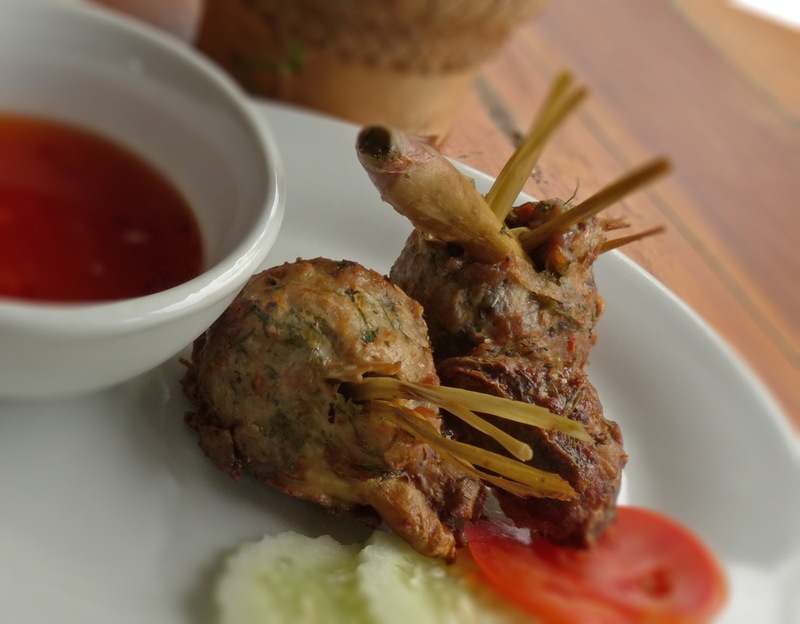 The Ousikhai is spiced minced port with lemon grass. A nice meal when combined with the perfectly cooked brown sticky rice. One last story to tell of Michel, the cat whisperer. 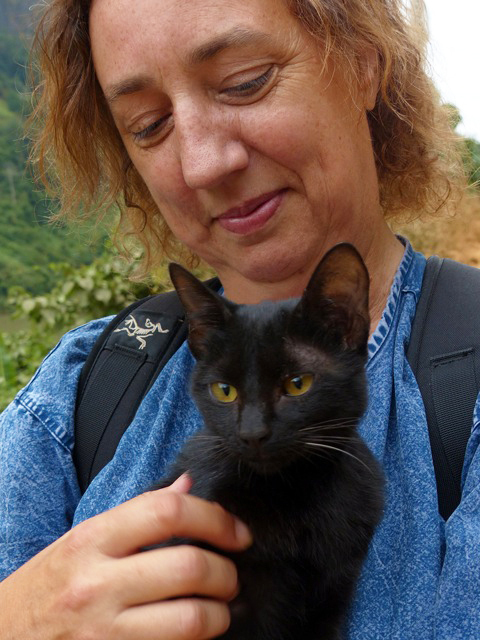 We went walking in the jungle on our first day and as we walked we could hear a cat yowling. The sound was completely out of place and desperate and we had to stop walking. About 20 feet above us we could see a little black cat calling to us. It somehow scrambled down the very steep rocks and practically jumped into Michel’s arms. The little thing was hungry and there were no people or buildings anywhere around. We guessed the cat had been left there to fend for itself or to die. It was obviously not a wild cat as it was relatively clean, healthy, and loved to be petted and held. Not knowing what to do we walked back to civilization with the cat purring happily in Michel’s arms. As we got closer to the hotel I started to panic; what do we do with the cat? I just did not see how saving a cat in Laos could end well. We decided to take it back to our hotel and turn it loose hoping it would find a home. That night when we went to dinner we found the cat waiting for Michel outside our hotel room. She followed him up the path to our favorite restaurant. We are happy to report the little cat was adopted by the owner of the restaurant. We were satisfied to see that she was quite happy and well fed each time we visited. She spent several of our meals sitting in Michel’s lap. We do not know how her story will end but for now she seems content. 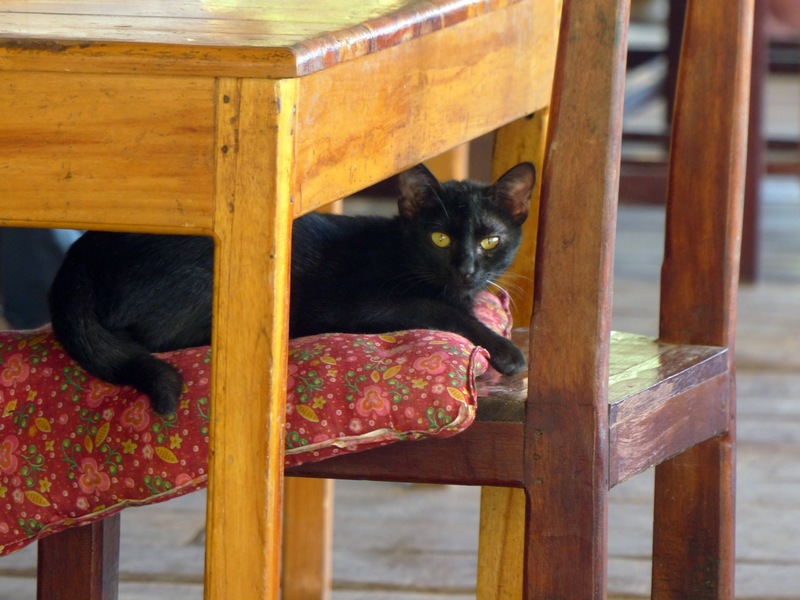 In many restaurants in Laos you will eat dinner with a cat or two underneath your table. They are usually fed scraps by tourists and locals alike. The locals mostly tolerate them but I have seen no cruelty displayed. Thanks so much recommending Vongmany to us. They were wonderful hosts and the food was so good we never ate anywhere else. Wow, great Blog! My sister Wendy who is teaching English in China also rescued a cat, she brought it back to the US with her, and a lovely cat it is! I am sure that your kitty will be fine. I really enjoyed the beautiful photos and am so glad that you are enjoying your time there, stay in touch! Michel and I are so happy to have you reading the blog. Michel says to send you a kiss from the frenchy. Am happy for you guys. This place looks like paradise. Hi Claire, Finally read the whole thing. Kept trying and getting interrupted and off to other things. I loved reading about your adventures and seeing the pictures. So glad you saved the cat! Poor kitty! We are fostering two little kittens right now…. one all black, and one black with tuxedo (white paws and chest and whiskers)…. it will be so hard to give them up but we have too many cats already. It sounds like you are getting good workouts with your hiking and biking. How do you feel…. do you notice a big difference from how you feel now compared to the stress filled days of computer work? What are your observations about 2008 (when more untouched) compared to now (as they get modern conveniences/power) and how the changes have affected the culture and peoples lives? When I see how distracted and isolated (relatively speaking) our lives and relationships are in this modern era as compared to more primitive families/communities I think maybe they have it better but I have not observed as you have so tell me what you think. Sonia and Andrea are coming to visit this weekend. Miss you! Hugs and love to you and Michel. Dear Claire, It is such a pleasure to find your wonderful words and your husband’s remarkable photography. Although Lao keep it to themselves, many families in most of the ethnic groups do use dog for nutrition and its special taste.. Many also keep them as pampered pets. I don’t think that many Lao eat cats, although that’s one of many subjects that Lao will not give foreigners direct answers about. In my reply to your blog about Luang Prabang I mentioned Anousith and recommended him as someone for you to get to know. His home village is Muang Noi, and he is there frequently to oversee his bar/restaurant. 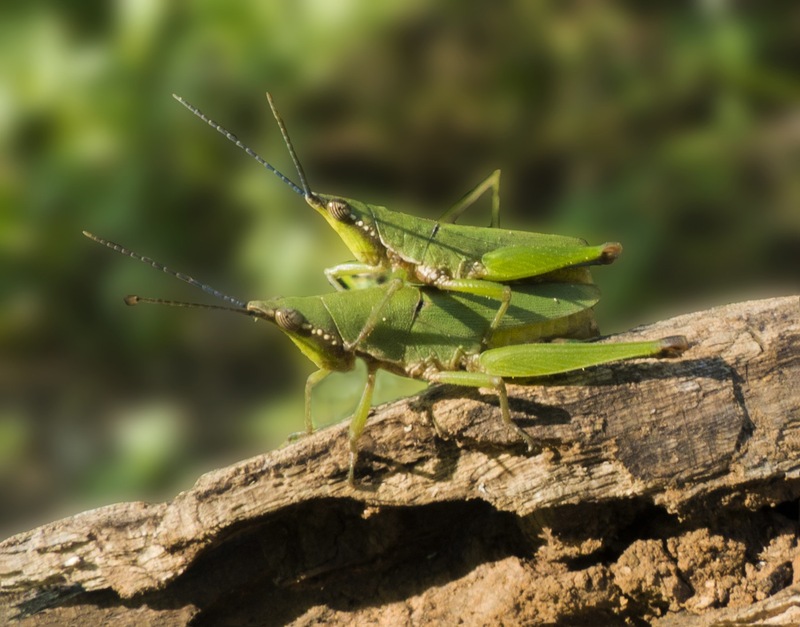 Your husband’s incredible photographic skills remind me of an Australian photographer who spent months capturing the beauty and life in many northern Laos ethnic villages. I can’t recall his name now, but if you do not know of him already, I will attempt to get it for you. His work has been exhibited in several places in east Asia. 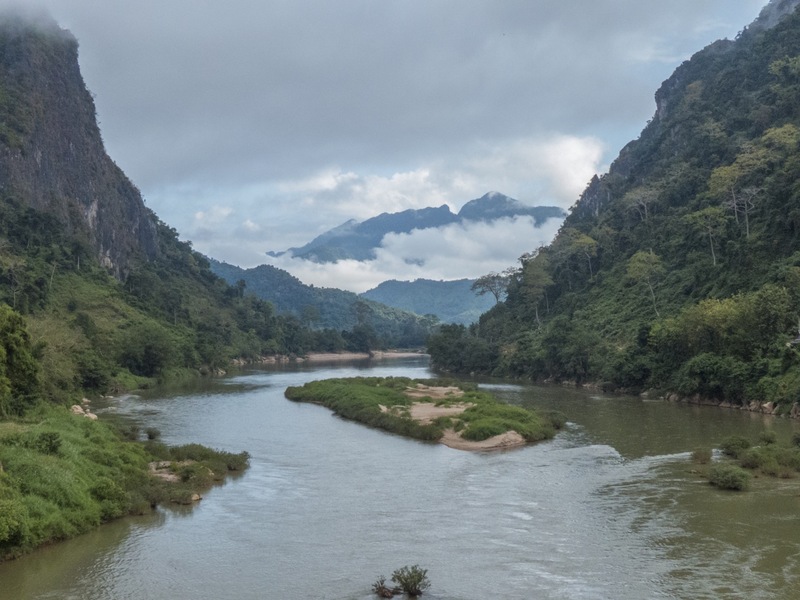 On a slightly different note, one of our volunteers, a 16 year old Khmu boy barely 3 years out of the jungle, put together some images of a 10 day auto trip through 6 northern provinces in June 2014 and has edited them into a video: . 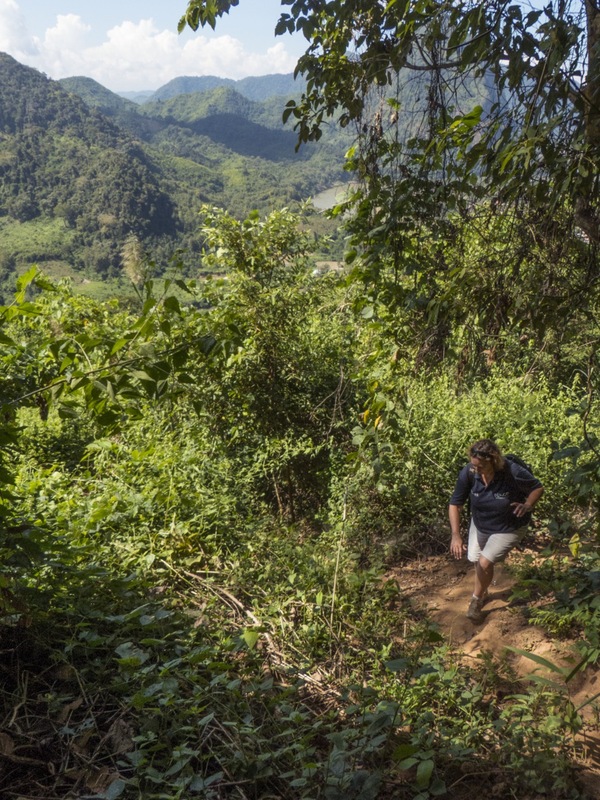 Its images include glimpses at spectacular areas of Laos that should be on one of your future itineraries. Thank you for your wonderful words. My husband and I will return to Luang Prabang in early September this year. As usual, we are very happy to return and look forward to following up on your contacts in the area. 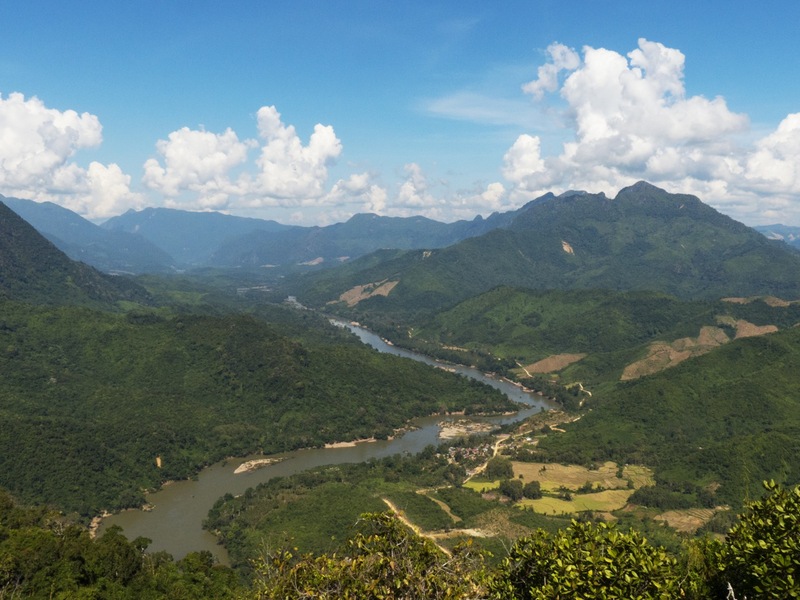 We plan to stay for a couple of months off and on as this area and explore more of eastern Laos as well. My husband and I met Joy who I believe is the wife of the Australian photographer. My husband has the photographers name and we’ve seen his work which we truly enjoyed. Will you be in Luang Prabang as well. Would love to meet you.